After being a CA reader for many years, it is very exciting to be here, and I hope that you enjoy my first issue. We start with the goods yard that once stood next to St Pancras station. In its heyday, this supplied the capital with Midlands victuals, but unlike St Pancras there was no appetite to save it from the wrecking ball. 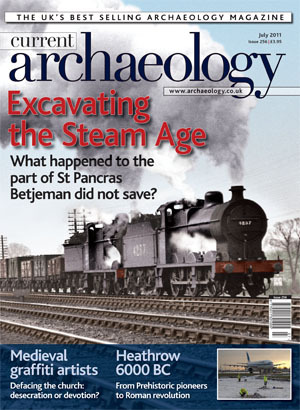 Now, redevelopment allows us to examine the archaeology of the Age of Steam. From trains to planes, and Heathrow’s Terminal 5. Archaeology seeks out everyday life in the past, and here it is: a landscape devoid of forts, villas, or mansions. This is the story of where real people lived. Mysterious burnt mounds are a staple of the Irish landscape. Over 5,000 of these enigmatic features are known, and they are generally believed to have been used for cooking. But there is another possibility — were these really Bronze Age microbreweries, quenching the thirst for a Prehistoric pint? Beer and graffiti can go hand in hand, in which case the Medieval parishioners of Norfolk also knew how to have a good time. But rather than many of today’s scrawls, their etchings, including a fleet of engraved ships, had a more sober purpose. While the St Pancras passenger terminal was spectacularly saved, its neighbouring goods yard was abandoned to decay and demolition. Excavations at Terminal 5 have provided a refreshingly ordinary slice through the English countryside, revealing an archaeology of everyday life. Are Ireland’s mysterious burnt mounds really Bronze Age microbreweries? Experimental archaeology recreates the Prehistoric pint. Norfolk’s churches are riddled with the works of Medieval graffiti artists, but who were they, and why did they do it? New light on Mithraic Scotland; Scottish skulduggery; Human remains found in Bronze Age pots; Roman theatricals in Canterbury; Iron Age brain matter; Embracing death in the Cotswolds; Face of Franklin’s Arctic expedition. Mike Parker Pearson, a Neolithic house, and a memorable image. Ethics and Burial Archaeology; Contesting Human Remains in Museum Collections; Imperialism, Power, and Identity; The Time Team Guide to the Archaeological Sites of Britain and Ireland. Andrew Selkirk tries to take a holiday from archaeology, and fails. Previous Roman Fort Next Go Digging!